Both the Lakeside City Alliance (LCA) and the Tucker2014 cityhood studies tell us what we already know. Tucker is the place to be. A one-line synopsis of the LCA study might as well read, “LCA funded Study Indicates Tucker is a Great Place to Live” or “Study Says Lakeside City Viable – If it Includes Tucker.” Remove Tucker from the proposal and it doesn’t work. Without Tucker, the resources the LCA needs to support a city dry up. 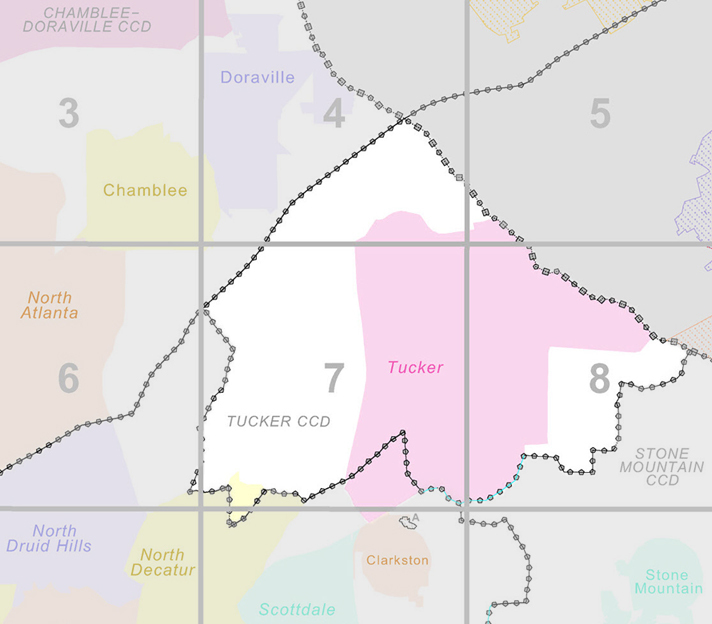 The City of Briarcliff Initiative (COBI) relies less on Tucker in their proposal, but in recent weeks they’ve increased their efforts to incorrectly define Tucker as only existing outside I-285, and their characteristic good will seems to be fading. Some are complaining that Tucker’s advocacy group, Tucker2014, isn’t compromising on boundaries. Whether this is true or not, it’s difficult to call it “compromise” when the only group asked to give anything up is Tucker. Tucker is a physical reality. The communities proposed by the LCA and the COBI only exist on paper. The message both groups are now sending is that they need Tucker for their plans to work. If Tucker won’t let go, Senator Fran Millar and the LCA have proven that they are not ashamed to lay claim to what they want. Can a City of Tucker thrive without Northlake within its city limits? Possibly. That’s not the question because Northlake – all of Northlake – is already in Tucker. Asking Tucker to let go of Northlake or Montreal is a bit like asking someone to have his or her arm amputated simply because someone else thinks it’s a nice arm. Can a person live a fulfilling life with only one arm? Yes, but why let someone take an arm without resistance? Claiming that the person has a great arm on the other side of his or her body is not a reasonable argument. To carry the analogy further, in the case of the LCA, more than the arm is wanted. It doesn’t take a physician to see that the map reaches deep into the heart of Tucker to excise Henderson Park and more. The recently modified LCA map drops the awkward jog across I-285 encapsulating medical practices in Tucker on Montreal Road. Yet the parasitic hunger continues to lunge forward, this time within 60 feet of Tucker High School. Something powerful is fueling the desire to cannibalize Tucker and Frankenstein together a new community. If not, why are Senator Millar and the LCA working so hard to take half of it? What about the $30,000.00 incorporation studies the State required each group to fund? Do the results no longer matter? The studies took months to complete, each determining economic feasibility based on geography, but with Senator Millar’s assistance the LCA presented a different map to the State and Local Governmental Operations Committee. A map that was not part of the State approved University of Georgia study and, after a quick bathroom break, senate committee members Mike Crane,Hunter Hill, Chuck Hufstetler, and William T. Ligon, Jr. approved it. Critics may read this and think, ‘No one is taking anything from Tucker, everything belongs to DeKalb County.’ That would be a fine argument if those same critics proposed keeping everything in the hands of the County, but the majority do not. They want to take it for themselves. If there were a zip code, census county division, expressway exit signs, etc. bearing the name Lakeside for the past 50 years the LCA would be claiming the area belongs to the community of Lakeside. Problem is, there are no such signs and no such community. It must be irritating to see the name “Tucker” written predominately in so many places at the county, state, and federal level. This whole endeavor is more than a bit embarrassing to many living in the Lakeside and Druid Hills high school districts and, according to LCA straw polls, it doesn’t reflect the desires of the people inside the Perimeter. Perhaps that is why fears related to “what if” questions about high school feeder districts changing, concerns about crime, and real estate values have held such sway in LCA discussions outside of I-285. Why try and sell a bill of goods in Poland if no one is buying it in the motherland? That the motherland isn’t buying in bulk ought to mean something. There is something magnetic within Tucker that both groups want, but haven’t created on their own. From the outside, it must look easier to divide and conquer than to build. Thankfully, the Legislature is frozen out this week, keeping slippery ideas off the senate floor. Hopefully, this short cooling down period will motivate those in positions of authority to consider the wider consequences of “winning” the prize. If not for the word “Seaboard,” current discussions over cityhood might cause some to think this is a recent quote. It isn’t. 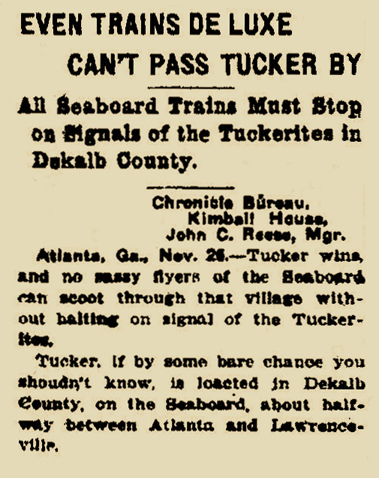 It’s from a 1913 article on the decision of the railway commission, requiring Deluxe trains to stop when hailed at the Tucker depot. A century later, as unlikely as it seems, some in the area have lost track of exactly where Tucker is located. Like the “sassy flyers” of the past, perhaps they too have scooted through without halting. Perhaps this lack of knowing is genuine, or maybe there is another motive behind dismissing Tucker. It’s difficult to know and unwise to speculate, but “if by some bare chance you shouldn’t know,” there are plenty who do. The Georgia Department of Transportation makes the location of Tucker abundantly clear to hundreds of thousands of daily commuters. Signs in both directions on Hwy 78 and I-285; Exit 37 “LaVista Rd Tucker,” Exit 4 “Mountain Ind Blvd Tucker,” and Exit 7 “Hugh Howell Rd Tucker,” all point to Tucker. The road connecting the communities of Chamblee and Tucker is called, of all things, “Chamblee-Tucker Road.” It crosses both I-285 and I-85 and rarely a weekday goes by without mention of the road in multiple traffic reports. Mark Arum, Scott Slade, and Captain Herb, know where Tucker is located. Their voices, along with the voices of Clark Howard, Walter Reeves, Kirk Mellish, Jamie Dupree and others, transmit to millions of commuters and homes across North Georgia from the WSB tower in Tucker, Georgia. DeKalb County Fire & Rescue know that both Station #5 and Station #22 are in Tucker. The County also knows that Henderson Park, Kelley C. Cofer Park, and Peters Park are in Tucker. The administrators at Emory University know that their Orthopaedics and Spine Hospital is in Tucker. The US Postal Service has known the location of Tucker is since at least 1892. Tucker has been around for a while. The Tucker Mattress Company opened in 1917; Tucker High School in 1918; Cofer Brothers Inc., in 1919; and Tucker received a US Census Bureau designation in the 1930s. The Tucker Masonic Lodge No. 42 opened in 1940; Matthew’s Cafeteria and Tucker Football League in 1955; Tucker Business Association,Tucker–Reid H. Cofer Library, and Bikeways of Tucker in the 1960s; and Triumph (Tucker) Youth Soccer Association in the 1970s. But, “if by some bare chance you” still don’t know where Tucker is, have confidence that Jason’s Deli at Northlake Festival knows the location of their “Tucker Deli.” Folks Southern Kitchen knows they are in Tucker too. So do the owners of Mellow Mushroom, PetSmart, and Chick Fil-A. Waffle House has four locations spread across Tucker. If that’s not enough south in your mouth there’s the Old Hickory House, and yes there’s an IHOP for flapjack lovers. Yet at 529 words into this article, it becomes silly to keep pointing out every instance of the word “Tucker” or every well-known establishment in Tucker. The pressing question isn’t “where is Tucker.” The question is what will become of Tucker in the near future and who will determine that future? For most, the boarders of Tucker fade out in various directions and there hasn’t been a need to draw lines. Like it or not, Tucker has never been exclusive. The us against them mentality doesn’t work well in DeKalb County and it finds no comfort in Tucker. Signs in support of the Lakeside City Alliance (LCA) along Henderson read “Don’t get left out,” seemingly unaware they are already in Tucker. Will the LCA and their sister organization, convince those within their proposed city boundaries that a new community is the right solution? Can they convince residents in parts of Tucker to join them? Change is essential to healthy growth and Tucker welcomes sassy fliers from every direction but when the signal goes up to slow down and stop, it’s time to stop. Like hundreds of rural and suburban communities across the state, Tucker will likely define its own future. In the meantime “if by some bare chance you” still don’t know, unincorporated Tucker, with over 1,700 employers and an annual payroll of more than $1.3 billion, continues to flourish on both sides of I-285.